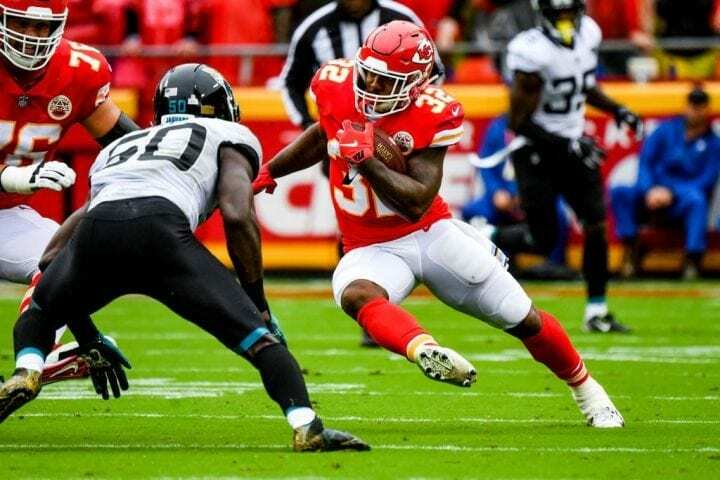 Although we do not endorse wagering at Tiebreaker.com, we did point out how likely it was that the Kansas City Chiefs would destroy the Jacksonville Jaguars when the league’s best offense met its best defense. You may remember the statistical tidbit from the Elias Sports Bureau that we shared: This would be the seventh time in the last 20 years, in games played on Week 5 or later, that the top offense would be asked to deal with the top defense. The offense had been 5-2, averaging 30.1 points. Kansas City 30, Jacksonville 14. Take it to the bank. You are welcome. Of course, it would be wrong for us to take all the credit. The Chiefs multi-faceted offense run by the Magic Man, Pat Mahomes (22-of-38, 313 yards), laid waste to the Jags to remain the only undefeated team (5-0) in the AFC. And this was the case even though the Jags gained 78 more yards than the Chiefs did. What was unexpected was how opportunistic the Chiefs defense was. Ranked last in the NFL, with two defenders lost through ejection, they gave up another 502 yards. Then again, Blake Bortles is Jacksonville’s quarterback. He completed 33-of-61 for 430 yards. But he added four interceptions and was sacked five times. It’s hard to keep up with Kansas City. The Chiefs have trailed only once in the first quarter and have outscored opponents by 50. On Sunday, Mahomes directed a 73-yard TD drive on his first possession and the Chiefs were up 30-7 early in the fourth quarter. For decades, the range of field goal kickers had been defined by one unforgettable moment, Tom Dempsey’s 63-yard field goal that gave the New Orleans Saints a win over the Detroit Lions on Nov. 8, 1970. What made it more remarkable was that Dempsey was born without toes on his right kicking foot, no fingers on his right hand and was wearing a shoe manufactured with a flat front and large toe surface. He made the kick with the straight-ahead approach then inherent in the game. Not until Denver’s Jasom Elam’s 63-yarder against Jacksonville in 1998 did anyone match Dempsey’s record. At not until Denver’s Matt Prater kicked a 64-yarder on Dec. 8, 2013 did anyone exceed it. Since then, making kicks from that distance has become relatively commonplace. But that shouldn’t take anything away from what Carolina’s Graham Gano did with six seconds left in the Panthers-Giants game. 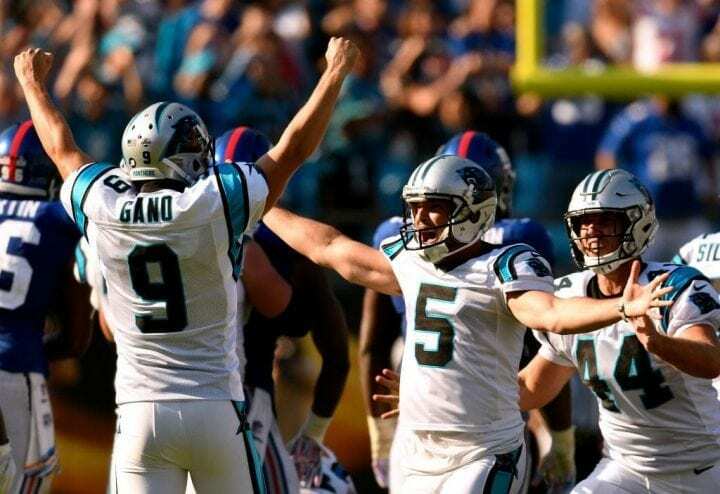 Gano blasted a 63-yarder to beat New York 33-31. It was the sixth field goal of 63 yards or more in history and tied Dempsey’s record in terms of game-winning kicks. Gano said after the game he’d made a 75-yarder in Denver’s training camp in 2012, but had no idea how long Sunday’s winner was, other than being able to see the Panthers logo spread across midfield. Gano’s kick was one of three game-winners on Sunday. Buffalo’s Stephen Hauschka made a 46-yarder with four seconds left to complete the Bills’ improbable 13-12 win over the Tennessee Titans. And after missing an extra point and 55-yarder at the end of regulation, Cleveland’s Greg Joseph lined a 37-yarder with two seconds left in overtime to give the Browns their 12-9 win over Baltimore. But it wasn’t just a highlight day for kickers. Green Bay’s Mason Crosby, the team’s career scoring leader who was 10-of-11 coming into the game, missed four field goals and an extra point in the Packers’ 31-23 loss in Detroit. 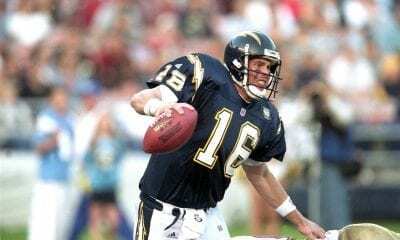 He is now just the second to miss four field goals and an extra point in the same game, joining the Chargers’ Rolf Benirschke in 1980. The Giants have big problems, a lot to say for a team that finished 3-13 in 2017. And Gano’s game-winner, which dropped New York to 1-4, certainly exacerbated it. And wouldn’t you know it, our guy Odell Beckham, Jr., is right in the middle of it again. Before the game, Beckham, made the NFL’s highest paid receiver by his boss a month ago, revealed dissatisfaction about how he’s used, the Giants offensive coaching staff and Eli Manning’s lack of mobility in an interview with ESPN. It’s no surprise Giants coach Pat Shurmur was livid. And depending on who you believe, he either forced Beckham to apologize to his teammates or just agreed to let him to speak to them. This was Shurmur after the game: “”All right, listen, I’m going to answer all the drama questions right now, and I’m going to go back to what I said. I addressed it with Odell. I addressed it with our team. I publicly declared that I didn’t agree with his comments. And I asked anybody who’s interested that if they wanted a clarification to go to Odell because he’s a big man. After making eight catches for 131 yards and one TD, and throwing for another TD pass, Beckham was asked about it comments. Oh, and one other thing. Did you see Giants receiver Sterling Shepard demolish that trash can just before the start of the fourth after one of Manning’s interceptions? We will say it again: They should have drafted Sam Darnold, Josh Allen or Josh Rosen. Too bad, so sad. Speaking of the rookie QBs, Week 5 will be remembered as the first during which they all won at the same time. The best individual performance was from No. 1 pick Baker Mayfield. He completed 25-of-43 for 342 yards and a TD, a performance rewarded by Joseph’s game-winning kick in OT. That was set up by his 39-yard completion to Derrick Willies. It was Cleveland’s first Sunday win since Dec. 15, 2015 and it snapped an 18-game winless streak in the AFC North. Darnold was 10-of-22 for 198 yards and three TDs in the Jets impressive 34-16 win over Denver at MetLife Stadium. 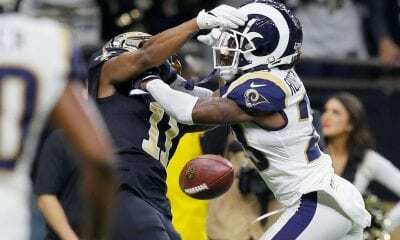 His performance was overshadowed by a franchise-high 219 yards rushing (on just 15 carriers) from Isaiah Crowell that included a 77-yard scoring run in the second quarter. Powell’s average of 14.6 yards a carry in an NFL record for backs with at least 15 carries in a game. Bilal Powell added 99 yards as the Jets tore open Denver’s defensive front for 323 yards. Rosen was 10-of-25 for 170 yards as the Arizona Cardinals beat San Francisco for their first win of the season. His performance was highlighted by a 75-yard TD strike to Christian Kirk on Arizona’s first offensive play. However, the Cardinals averaged only three yards a play for the remainder of rh game. Allen was just 10-of-19 for 82 yards in the Bills win over Tennessee. But he scored Buffalo’s first TD on a 14-yard run. Although it happened last Thursday Night, it would be remiss if we didn’t mention Tom Brady’s milestone in New England’s 38-24 win over Indianapolis. Brady became just the third NFL QB to throw 500 TD passes, hitting Josh Gordon for a 39-yard score to join Peyton Manning (539) and Brett Favre (508). 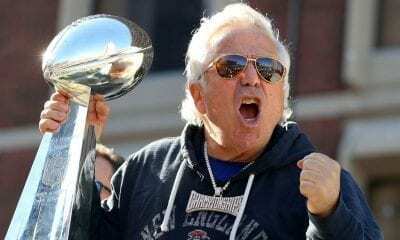 What separates Brady is that all 500 have come with the Patriots. Of course, those don’t count the 71 he has in the postseason. If you were add those in, Brady’s 568 would trail only Manning’s 579. And we all know Tommy is going to play a few more seasons. His next game will be Sunday’s Night’s showdown with the Chiefs, who are 5-0 for the second straight season. Trivia question: Who caught Brady’s first TD pass in 2001? Terry Glenn.